The Ruby-throated hummingbird, also known as Archilochus colubris, is found throughout the eastern part of the United States. These are incredibly curious and trusting hummers. Once you build a Ruby presence in your hummingbird garden you can enjoy them feeding directly from your hands. You can’t miss these beautiful creatures. Their vibrant greens and reds absolutely glitter in the sunlight. Male Colors: Emerald green on crown and back. Brilliant red throat. An immature male doesn’t have the red throat yet. Female Colors: Emerald green on crown and back. White breast and throat. Outer feathers are white-tipped. Size: Small, about 3 to 3 ½ inches in length. Bill: Needle-like bill that curves down slightly. 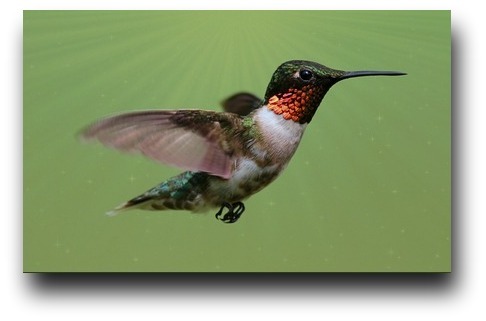 Each day, a Ruby-throated Hummingbird will eat its own weight in food. Like most other hummingbirds, it will eat sugar water from your feeder, nectar from flowers and insects for protein and fats. Common flowers they enjoy feeding from are: honeysuckle, trumpet creeper, red morning glory, cardinal flower, red buckeye, bee-balm, and jewelweed. If you’re lucky, you may even see one eating insects straight from a spider web or in the air. Each feeding time is about 30 seconds to 1 minute and they’ll eat about five to ten times every hour. A Ruby needs to consume approximately 10 calories each day for survival. As well, they can stop in an instant after flying incredibly fast up, down, and backwards. They migrate north during February toward the eastern part of America. Many of them fly the 500 mile stretch over the Gulf of Mexico that takes an estimated 20 hours, revealing their incredible stamina. By September, they begin migrating back south again. During the winter months, they’ll live throughout Central America, Mexico, and even the Caribbean islands. Some stay in the US near the Gulf of Mexico and others stay in N. Carolina’s Outer Banks. Ruby-throated Hummingbirds love to live where they can find food and secluded resting areas. This includes backyard gardens, parks, grasslands, edges of forested land, meadows and open woodlands. You can find them along the East Coast from the Gulf Coast to the southern area of Canada. Like all hummingbirds, the mating act is quick. Once done, the male and female go their own way. The female builds her nest in order to lay her two white eggs. About the size of peas, her eggs hatch in about 15 days. On average, the female Ruby will place her nest about 18-20 feet above ground. Sometimes, a nest will be as high as 50 feet or as low as 5 feet off the ground. They like to nest in tiny, down-turned limbs. Nests are usually made with webbing from spider webs, dandelion down and lichens found on trees. Interestingly, when her chicks leave the nest about 20 days after birth they are already larger than mom. The mother will feed her fledglings for about 10 days after they leave her nest. It can’t walk or hop because of its short legs. However, it can still use its leg to scratch its head. Scientists call them Apodiformes, which means to be without feet. Although they prefer their natural habitat they’re known to place their nests on wire, extension cords or chains. Every second it beats its wings over 50 times.